Foosball is a form of table soccer played by twirling and moving bars with the players on them to hit the ball into the goal. 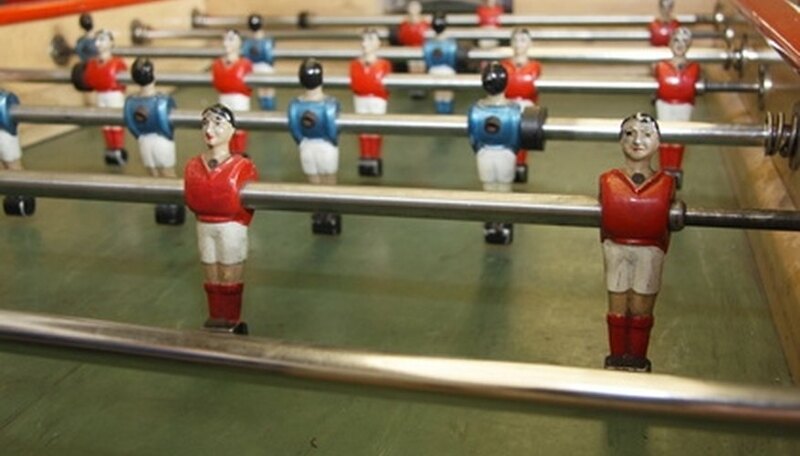 When you buy a foosball table, the rods with the players might not have been installed, and you will need to set them into the table. There is a proper manner to set the rods into the table so that your foosball table is ready for game play. Follow these steps. Place the foosball table in an open space. There should be at least 3 feet of space along the two sides so that the players can freely move to control the player rods. Look at the rods, and notice that each one has a different number of players attached to it. Depending upon your table, you might have four rods with three players, but two of those are shorter. The shorter pair of the rods with three players are the goalie rods. The goalie rods might also have a single player on them. Take the goalie rods and insert them into the slot at either of the far ends of the table. Make sure that the players on the rods are facing each other. This means that the handles for the rods will be sticking out on opposite sides of the table. Notice the color of the goalies' uniforms on each side. For simplicity, say that the teams are red and blue. In the second slot from either end of the table, you will place the rod with two players which wear the same color uniform as the goalie rod to which they are closest. These are the defender rods. Keep in mind that the third row from the goal will be the opposing team's three player rod. These rods will be longer than the goalie rod. The players on these rods should face the opposing goalie. Know that the last rods to put in will be the five player rods the same color as the goalies to which they are closest. These two rods will face each other in the center. Make sure that you have the colors and the number of players correct. From one end of the table you will have: blue goalie rod, two blue player rod, three red player rod, five blue player rod, five red player rod, three blue player rod, two red player rod and red goalie rod. Place the ball in the center and enjoy your game of foosball. What Instruments Are in a Wind Symphony Orchestra? What Are the Four Families of Instruments in an Orchestra?